WALTHAM, MA--(Marketwired - Dec 11, 2013) - CloudLock, the leading cloud information security provider, announced today a new line of innovation-focused projects, CloudLock Labs. As part of the release, they have also made the first offering to carry the Labs name available on the Google Apps Marketplace, GeoFence for Google Apps. Organizations can use this experimental new solution to track where their users are accessing data from, what locations users are logging in from, and any changes made by admins in their domain. As a CloudLock Labs project, GeoFence for Google Apps represents a new line of highly innovative offerings for the cloud security company, designed to respond to risks that traditional security products can or do not address. "We envision Labs as an innovative, adventurous, and essentially customer-driven way to drive cloud security forward. Look at the news on any given day and you'll clearly see that the number of risks and data breaches is only accelerating; we've introduced CloudLock Labs as part of our commitment to innovation in helping organizations meet those challenges," said Ron Zalkind, CTO and lead researcher for CloudLock. CloudLock is introducing GeoFence as a free offering to the CloudLock information security solution suite. 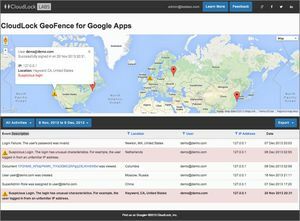 As the only security vendor offering this capability, security professionals using GeoFence can quickly identify activity within their Google domain, where those users are logged in from, and what changes are occurring inside of their domains (for example, users being added to or removed from groups). This location-based awareness is designed to give administrators the ability to identify potential data theft and malicious activity before it becomes a data breach or data loss issue. "We are encouraging security professionals to explore the GeoFence functionality to see for themselves the benefits of CloudLock's security products," continued Zalkind. "Being able to manage and reduce risk is at the heart of what we do, and GeoFence represents our ongoing commitment to helping organizations do so more efficiently and effectively." CloudLock is leading cloud information security company. Its information security applications enable organizations to enforce regulatory, operational, and security compliance in public cloud platforms. The largest organizations in the world trust CloudLock to secure their data in the cloud, increase collaboration, and reduce their risk. For more information about the company or reseller opportunities call (781) 996-4332 or visit http://www.cloudlock.com.